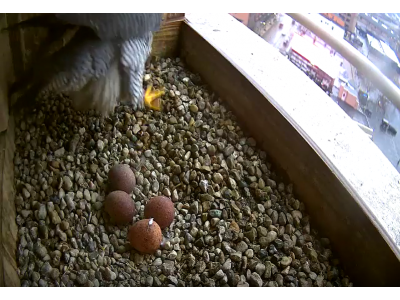 Rebecca laid the third egg in the afternoon on 3/23 and the fourth egg just before midnight on 3/25. Both Rebecca and Kewpee have been actively incubating the eggs around the clock. The span of egg laying this year was from March 19 – 25. In 2016, the span was March 19 -27. I am curious to see what the hatching dates will be this year and whether the chicks will hatch closer together than last year. We will have to wait for a month to learn what happens.